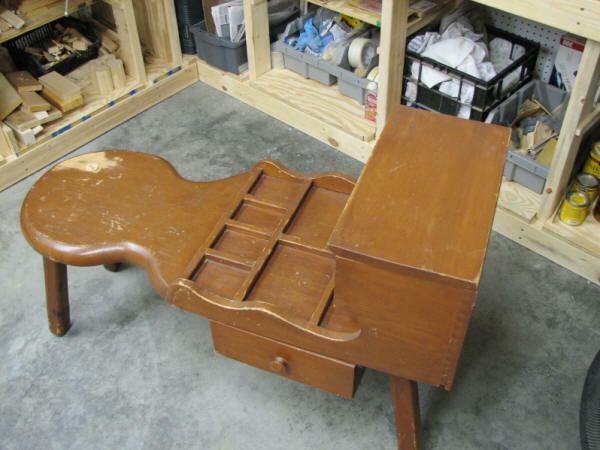 A natural extension of my model building activities has been many woodworking projects - both building and refinishing. Without going into a lot of detail, here are some of the projects for which I happen to have photographic documentation. My workshop currently consists of a 10" radial arm saw, a 12" drill press, 9" dia. / 6"x48" disc/belt sander, 14" band saw, and a router table - all Craftsman. A pretty good assortment of hand-held sanders, drills, and routers tops off the for power tools list. A pretty respectable assortment of clamps, hand tools, wood vise and metal vise, and good size wooden work benches help get the job done. 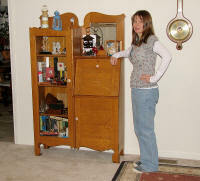 This regulator wall clock was purchased on eBay for around $50 in early 2007. 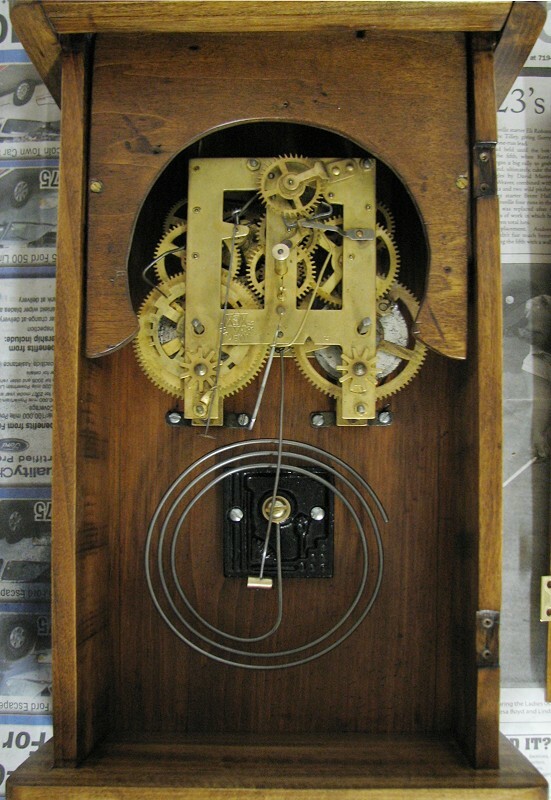 The mechanical pendulum-regulated, spring-driven escapement movement took a bit of cleaning, oiling and adjusting to get working; it can be seen in action online on YouTube. The finish as received was in really awful shape. It took a lot of chemical stripper to remove the finish. I removed as many parts as possible for sanding and the reinstalling. The design on the top plate was made of copper and was in very poor shape, with parts of it corroded away, I just disposed of it. 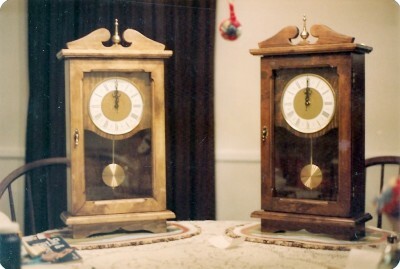 The brass dial ring, hinges, and pendulum were wire-wheeled and lacquered. The glass is silkscreened on the back surface. 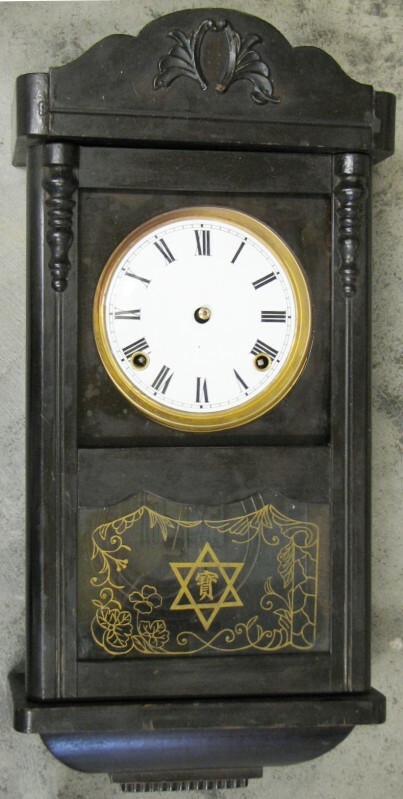 Interestingly, the clock was made in China (circa 1899), and has what looks like a Star of David pattern on in the middle. My standard Minwax stain with Deft lacquer clear coat was applied. Summer 2007. This is my second-favorite picture that Melanie has made. 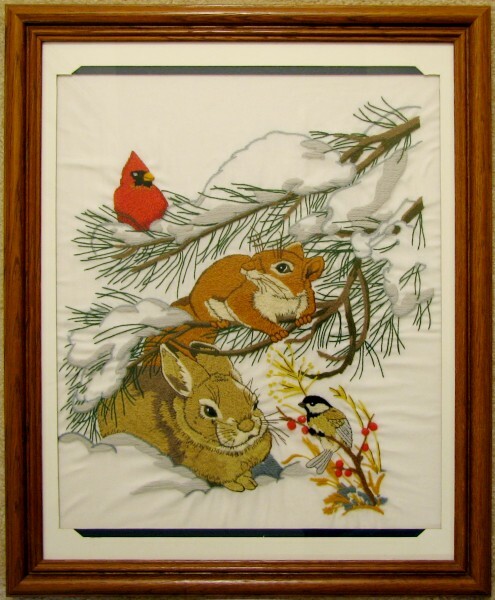 It is made using a form of embroidery called crewel. 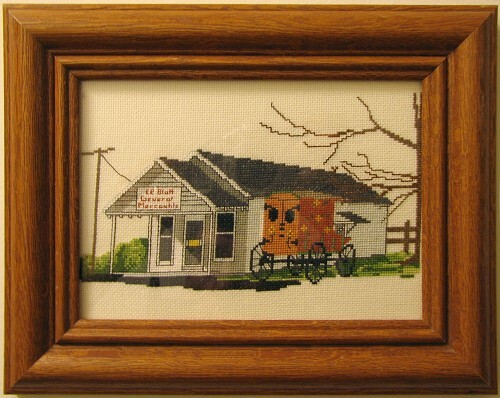 This is a fairly large picture that is mounted in an 18" x 22" oak frame. I did not make the frame. These two counted cross stitch pictures were done by Melanie sometime in the mid 1980s, when we lived in Arnold, Maryland. I made the octagonal frames out of mahogany sticks that we bought at Hechinger (a home store similar to Lowes and The Home Depot) that were being sold as stakes for tomato plants. The glass was cut from some old window panes that had been left in the basement of our house when we bought it. The frames are about 9½ inches from side to side. 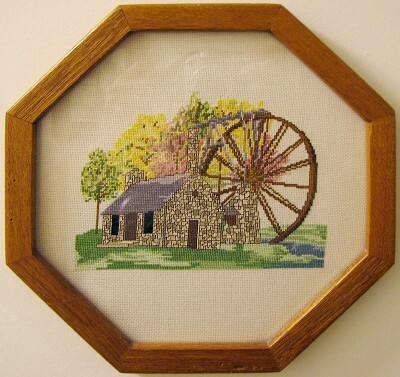 Two other pictures in the country building series were complete in later years. The rectangular oak frames for those two were purchased. Wow, talk about waxing nostalgic over a recently discovered photo! 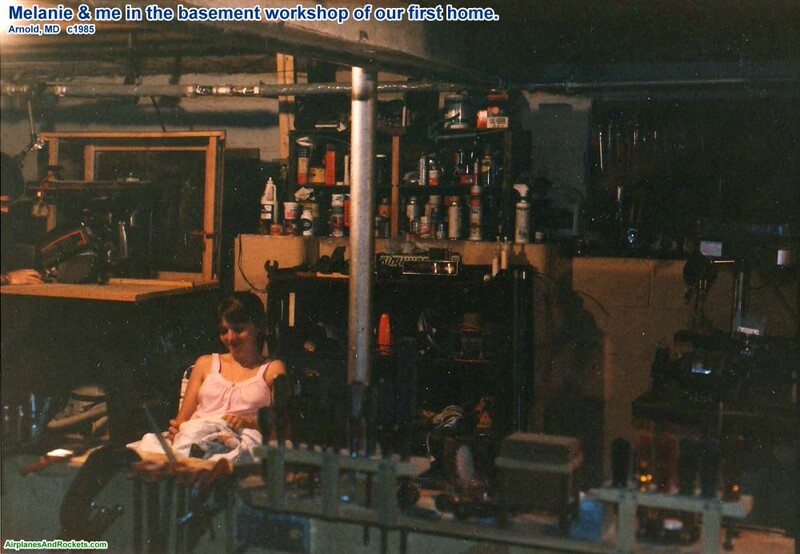 This was taken in the basement of our first home in Arnold, Maryland (just outside of Annapolis), sometime in 1985. 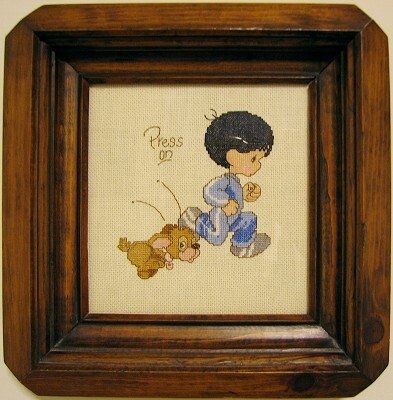 Melanie is in maternity clothes, working on a cross-stitch picture, whilst awaiting the birth of our son, Philip. You can see my head to the left with the radial arm saw. The basement was damp and dank; I put a lot of effort into trying to keep it dry enough to not rust the tools. In that workshop I built the weather station and a lot of the picture frames shown on this page. In the picture to the right, I was trimming a short section of oak floor molding. The cut came out very nicely. You can see that I did not put the tape as far to the left as I should have in order to protect the cut edge, but it was nice and clean anyway, with no splintering. Maybe that was because 1) the blade was sharp, and 2) the oak piece had recently been finished with a couple coats of polyurethane, so the wood grain was thoroughly filled and the finish had not turned brittle. 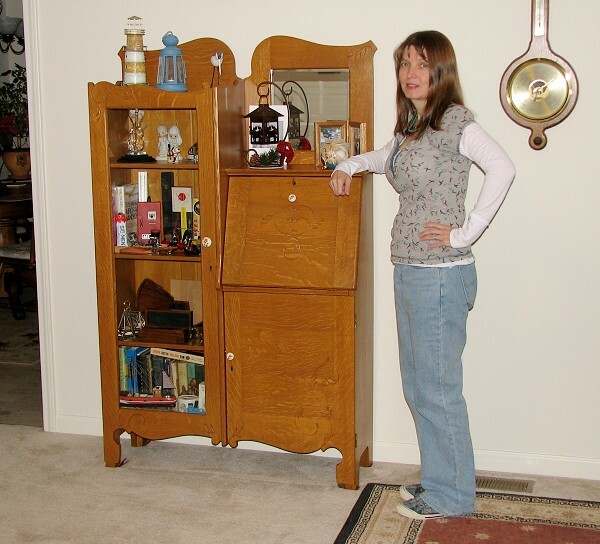 Update: My Lorraine Grandmother Clock is now (as of August 2013) 100% complete! This banjo style weather station is an original design that I designed and built waaaaay back around 1984, shortly after Melanie and I were married. The wood is laminated from three layers of wood that came from the side of an old farm house that Melanie's father tore down in West Virginia. The basic pattern was cut with a handheld saber saw, and the the final shape was formed with files and sandpaper - a lot of work. A router was used along the top edge for decoration. The hygrometer (top), thermometer (middle), and barometer (bottom), along with the finial at the very top, were ordered from Klockit (they've been around for a long time - like me). All the instruments are of very high quality. 1984ish. 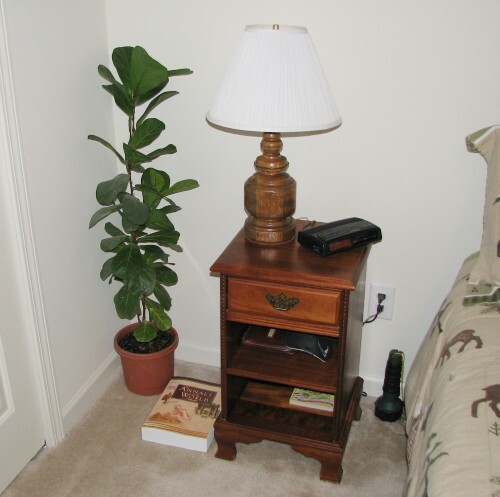 This antique nightstand was given to us by my Aunt Bernice, who lived in Mayo, Maryland. 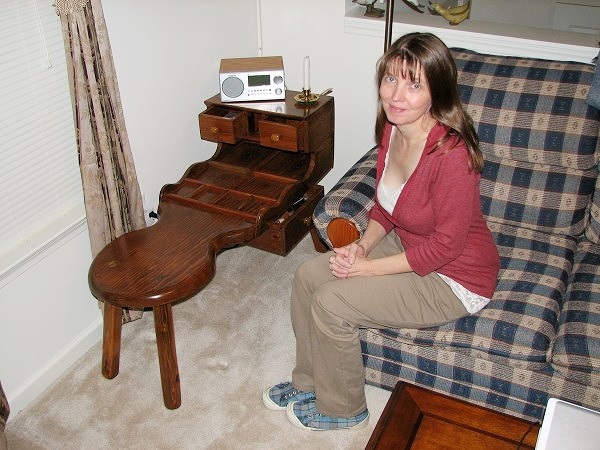 Like most of our other furniture, this was used as provided for a long time before undertaking a refinishing project. It was a pretty straightforward job. Chemical stripper followed by sandpaper followed by stain followed by a Deft lacquer top coat. I don't recall why I chose to use lacquer rather than polyurethane here. The drawer handle was sprayed hunter green, which looks good against the reddish stain. Melanie made the picture on the top for me before we were married. Before life robbed me of my time and willingness to do such things, I used to run a couple miles every day. 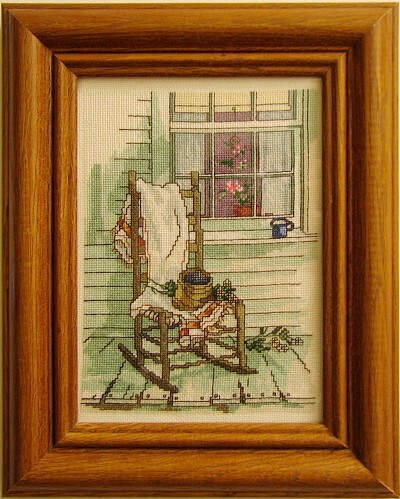 I never had a dog, but the picture was a standard one from the Precious Moments collection. She did change the hair color from the original sandy brown to black, to match mine. The picture at the bottom was made by Melanie after were were married (May 22, 1983). 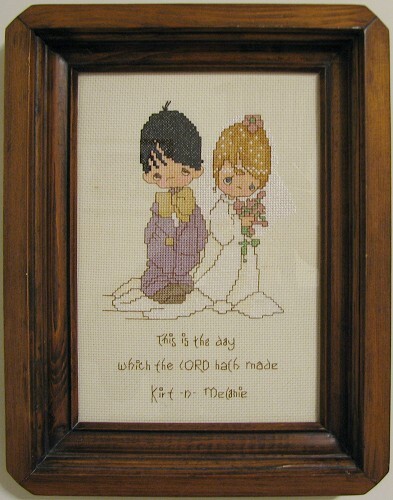 Both are counted cross stitch on 22-count fabric. I made the frames using my Craftsman table saw with a shape cutter head. If I recall correctly, the wood was standard framing 2x4 pine. 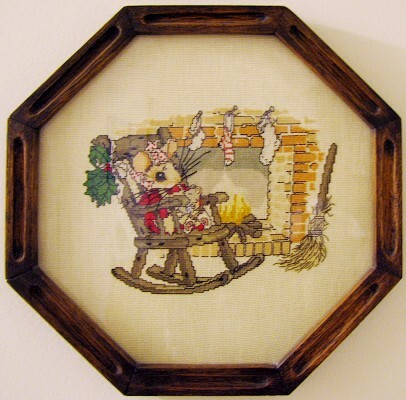 This counted cross stitch picture with a Christmas theme was also done by Melanie sometime in the mid 1980s. It sports the same type of custom built mahogany frame. 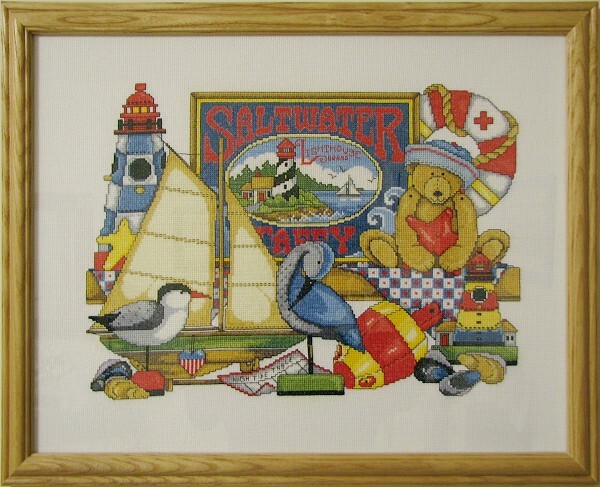 Melanie loves the seashore and sailboats, as you might have inferred from her selection of topics for pictures and from her having had a radio controlled Victoria sailboat at one time. 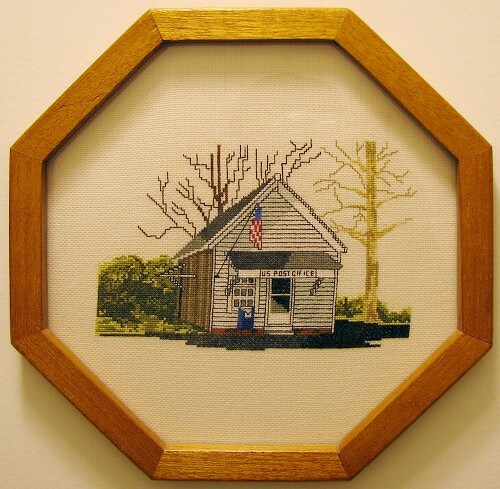 This was her first cross-stitch project in over a decade. 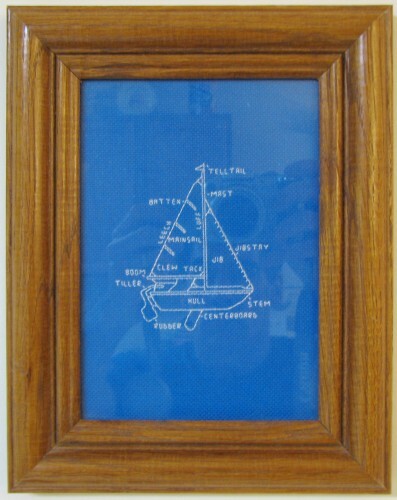 It is in a 16" x 20" oak frame (purchased). 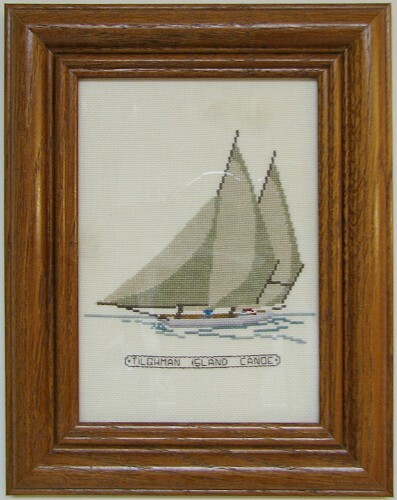 These sailboats are approximately 5" by 8". 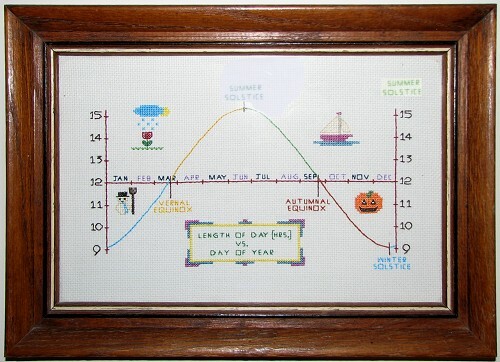 Here is a custom design that I came up with that plots the day of the year versus the length of the day (daylight), for the latitude of Annapolis, Maryland. Numbers were derived from table in the Old farmer's Almanac. 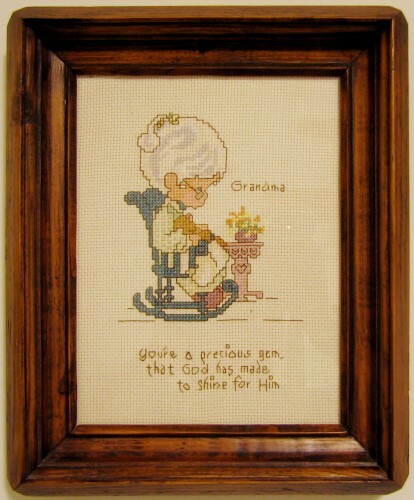 Melanie made this picture for her grandmother (mother's mother), who actually sat in a rocking chair and did needlework and sewing. It is also one of the Precious Moments series. 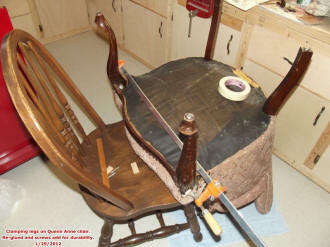 The frame is made in the same manner as the other pine models cut on my Craftsman table was. Sometime around 1999, we gave Sally a log cabin doll house kit for Christmas. It was a bit of a challenge to put together properly, but it came out very nicely. The simulated stone on the chimney was the most difficult part of the job.